We’d love your help. Let us know what’s wrong with this preview of Hank & Jim by Scott Eyman. New York Times bestselling author Scott Eyman tells the story of the remarkable friendship of two Hollywood legends who, though different in many ways, maintained a close friendship that endured all of life’s twists and turns. Henry Fonda and James Stewart were two of the biggest stars in Hollywood for forty years. They became friends and then roommates as stage actors in N New York Times bestselling author Scott Eyman tells the story of the remarkable friendship of two Hollywood legends who, though different in many ways, maintained a close friendship that endured all of life’s twists and turns. Henry Fonda and James Stewart were two of the biggest stars in Hollywood for forty years. They became friends and then roommates as stage actors in New York, and when they began making films in Hollywood, they roomed together again. Between them they made such memorable films as The Grapes of Wrath, Mister Roberts, Twelve Angry Men, and On Golden Pond; and Mr. Smith Goes to Washington, Destry Rides Again, The Philadelphia Story, It’s a Wonderful Life, Vertigo, and Rear Window. They got along famously, with a shared interest in elaborate practical jokes and model airplanes, among other things. Fonda was a liberal Democrat, Stewart a conservative Republican, but after one memorable blow-up over politics, they agreed never to discuss that subject again. Fonda was a ladies’ man who was married five times; Stewart remained married to the same woman for forty-five years. Both men volunteered during World War II and were decorated for their service. When Stewart returned home, still unmarried, he once again moved in with Fonda, his wife, and his two children, Jane and Peter, who knew him as Uncle Jimmy. To ask other readers questions about Hank & Jim, please sign up. Every review and blurb on this page mentions that Hank was the liberal and Jimmy the conservative. Does the book expand on this topic and explore specific political issues or the kinds of debates the two had? What was the big political argument that they had even about? As a BIG fan of Henry Fonda was I eager to read this book. I liked the idea of the book that it's a book about Hank and Jim, two very different men who became friends when they were young actors and stayed friends throughout their lives. It was fascinating reading about how they started out in the theater, their lives before they become famous, dating women, marriages (Jim one time while Hank 5), WW2 and how they were decorated for their services, the high and low of their careers. And, of cours As a BIG fan of Henry Fonda was I eager to read this book. I liked the idea of the book that it's a book about Hank and Jim, two very different men who became friends when they were young actors and stayed friends throughout their lives. It was fascinating reading about how they started out in the theater, their lives before they become famous, dating women, marriages (Jim one time while Hank 5), WW2 and how they were decorated for their services, the high and low of their careers. And, of course, the twilight of their lives, when they started to lose good friends who passed away, and when they both got older and finally when Hank passed away and Jim had to go one without his best friend. It's a fabulous book, and I loved how the friendship between the men lasted all through their lives, despite the difference for instance when it came to politics. Their shared loved for model airplanes was charming to read about. I also found the chapter about WW2 absolutely fascinating to read. So many Hollywood stars that fought during the war and it was interesting to learn that they both were more than figureheads that they actually did fight. And, that they didn't talk much about it later in life. Jim's children, for instance, had no idea what their father had done in the war, more than that he had been a soldier. Then we have their personal life. Hanks marriages all failed until the very last one (Shirlee, who he was married to until his death) while Jim found the right woman, Gloria, who he was married to until her death. Hank's first marriage ended when his wife committed suicide and after that came a string of marriages that didn't work out at all while Jim was in his 40s when he finally found the right woman to marry. It's interesting btw how Margaret Sullavan came to play a big part in both their lives, Hank marrying her, then divorcing since they could not live together, while Jim had a crush on her that lasted several years. It was a difficult birth, and Gloria stayed in the hospital for several weeks. Her release from the hospital provided her with one of her favorite stories about her dreamy husband. Jim went to get the car to pick her up, but sometime between leaving the hospital and getting in the car, he forgot that he was supposed to pick her up. Instead, he started driving home. Gloria knew her man. After twenty minutes of waiting, she told the nurse that he had forgotten about her. The nurse didn’t think such a thing was possible, but Gloria knew better. She told the nurse to take her and the babies upstairs. She would wait for the absentminded actor to remember what he had forgotten. On the way back home, Jim stopped at a photography studio to pick up some pictures. When the photographer asked after Gloria, Jim suddenly realized what he had done and ran for a phone. He’d be right there, he told her. There are many things I was expecting with this book and hoping for. First, I was hoping for a double biography, learning about both men, Henry Fonda and James Stewart. Learning about what made these men who they are, what made them tick. Second, I hoped to learn about their experiences in Hollywood (for example, working with Hitchcock, classic movies, etc.). Their friendship and misadventures were probably third of my list. Still, wasn't I promised all this? Little did I expect I would really n There are many things I was expecting with this book and hoping for. Little did I expect I would really not get any of my boxes checked. Probably the most disappointing is how little we dive into their experiences in Hollywood. The author also has this weird knack for acting as a judge and jury around their films. He will say rather flippantly "So and so made three films, two were good and one was bad." Why was it bad? Why were they good? And who made that decision. Critics? Finances? The author? You would expect at least a description of the movie, the reaction, but he rarely does this. He just wants you to roll with it. Trust me, I know what is good and what is bad. Sigh. Also, Hitchcock worked with both men. Do we meet Hitchcock? Get to know what it was like working with him. It is rare that anyone considers Hitchcock a "blip on a radar," but that is the case here. For some reason he is not important. In some ways, it feels like the first draft of a greater book to come. Something bigger, more bold. This is a skim of that book. Right now, I couldn't even tell you the name of Stewart's wife and I just finished the book. How is that possible? You walk away with almost the shrug, "They were just these two guys, you know." 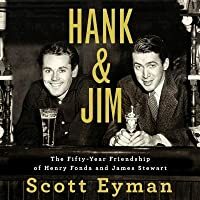 Scott Eyman has done us a favor with the writing of his book Hank and Jim: The Fifty-Year Friendship of Henry Fonda and James Stewart (Simon Schuster, 2017). First, he has chronicled through interviews with their family members and friends and archival sources, that two individuals, especially two well-known celebrities who hold well-defined and differening political perspectives, can be friends, work together, raise their families together, still care and support one another when one is riding t Scott Eyman has done us a favor with the writing of his book Hank and Jim: The Fifty-Year Friendship of Henry Fonda and James Stewart (Simon Schuster, 2017). First, he has chronicled through interviews with their family members and friends and archival sources, that two individuals, especially two well-known celebrities who hold well-defined and differening political perspectives, can be friends, work together, raise their families together, still care and support one another when one is riding the crest of success and the other is not, and do so over the course of fifty years! Second, Eyman has given us a very human view of two public men who were celebrities in their hey-day and, for a while after, who were also very private men, troubled at times, and two men who, even though they were becoming leading men in the motion picture industry, entered military service and served America during World War 2. What a gift for us is Hank and Jim: The Fifty-Year Friendship of Henry Fonda and James Stewart! Thank you Scott Eyman! Well researched and written from a sympathetic and yet honest point of view, Eyman chronicles the rise and the decline of Fonda and Stewart’s careers and lives in a manner which drew this reader/reviewer in. He goes behind the scenes of stardom and gets into the personal lives of both men, in an alterating narrative as the story develops. This reviewer’s interest was caught and held by two things Fonda and Stewart loved: model planes and cats! The story of the model Martin Bomber that they bought as a Christmas present for themselves in New York resonated with this reviewer who built model plans, plastic not balsa wood as theirs was, as a kid. As did their love of cats, including a group of feral cats that grew to over 30 despite their best efforts to domesticate them. With their LA rental house AND yard becoming flea infested the two decided to get rid of the cats by digging a hole in the fence of their next-door neighbor…an actress named Greta Garbo, with disatrous results, (and who eventually moved). It is great biography…and a fresh telling of Hollywood history in its golden years. It is a great biography…of two well-known stars and their trials and successes on screen and in real life. I rated this biography five stars on Goodreads. Note: I recieved a e-copy of this book from the publisher via Net Galley in exchange for a review. I was not required to write a positive review. First, a confession. I’ve been a fan of Henry Fonda and James Stewart for many years. I’ve not seen them perform on the stage but I’ve seen many of their movies. The big surprise for me was learning that they had been close friends for fifty years, starting with being roommates and stage actors in New York as young men. Stewart had been a pilot before the start of WWII and it was the right thing for him to be drafted into the Army Air Corps. (The U. S. Air Force would be formed after the war.) First, a confession. I’ve been a fan of Henry Fonda and James Stewart for many years. I’ve not seen them perform on the stage but I’ve seen many of their movies. The big surprise for me was learning that they had been close friends for fifty years, starting with being roommates and stage actors in New York as young men. Stewart had been a pilot before the start of WWII and it was the right thing for him to be drafted into the Army Air Corps. (The U. S. Air Force would be formed after the war.) He rose in the officer ranks while being a pilot of B-24s, a difficult aircraft to master, and later as a wing commander with the rank of colonel. Right after the war ended he was awarded the Distinguished Flying Cross, a medal second only to the Congressional Medal of Honor. Fonda joined the Navy and participated in several battles in the South Pacific on several ships and in units as an operations officer, earning the Bronze Star among other medals. After the war he performed on stage and film in the title role of Mr. Roberts. He proudly wore his own Navy hat in every performance. These two fellows were different in many respects. Fonda married five times but Stewart only once to Gloria McLean who already had two sons. Jimmy Stewart and Gloria would soon have twin daughters of their own. When Hank and Jim were together, they never talked about acting or politics. Instead, they liked to pursue outdoor activities such as flying planes, making and flying huge kites, and playing elaborate practical jokes on other prominent targets in the film industry. When not working on his acting craft Fonda liked to paint an even did needlecraft. Stewart liked to grow fruits and vegetables and often showed up at Fonda’s house with a basketful of produce. Fonda reciprocated with honey made from his own bees. Fonda made many movies and most were met with critical acclaim. His last movie, On Golden Pond with Katharine Hepburn and his daughter Jane, won him an Oscar shortly before he passed away. Stewart’s films were usually a bit more upbeat such as The Glenn Miller Story, Strategic Air Command and the perennially popular It’s A Wonderful Life which we’ll be able to watch again on TV very soon. When the Viet Nam war started, Jimmy Stewart’s stepson, Ron McLean, joined the Marine Corps and went to OCS. I have a clipping from the Quantico base newspaper showing Ron being commissioned a Second Lieutenant by Lieutenant General Lewis B. “Chesty” Puller. General Puller’s son was also being commissioned and is in the photo along with Mrs. Puller, and Jimmy and Gloria Stewart looking on proudly. (I was also stationed at Quantico then.) Below this same clipping I have a newspaper photo of the burial ceremony many months later when First Lieutenant Ron McClean was laid to rest at a Glendale, CA cemetery with the entire Stewart family in attendance. He was killed in action during combat operations in Vietnam. Henry Fonda didn’t approve of daughter Jane’s overtures to North Vietnam but didn’t try to stop her. Jimmy Stewart once went on a strong vocal tirade about the war in Vietnam, condemning those who dodged the draft and the higher level politicians who lacked the will to win the war. I tend to think that Stewart didn’t care much at all for Jane Fonda’s actions but probably never shared his views on that issue with Hank. 3) Stewart was always kind of miffed at how hard it was to pull of that sincerity that would have made others look foolish (invisible rabbit, angels, trying to get a Boy Scout weekend retreat put into a bill) and how he never really got credit for making natural look so easy. Fonda is another one whose voice I can instantly conjure up in my head, and I read pretty much every quote in the book said by its subjects with their own words. I also didn't know Henry Fonda's middle name was Jayne. I didn't know Marlon Brando's alcoholic homemaker mother caught sight of a young Henry Fonda crossing the street and decided he needed to be an actor, which is how he stumbled into acting. And I didn't know just how entwined Fonda and Jimmy Stewart's lives were--they really were platonic soul mates. Book focuses almost entirely on the friendship, which easily fills the book--so if you were hoping to read a lot about their films or a book slanted more towards professional lives, then this is not that book. Both families participated with the author (Fonda's children and widow) and Jimmy Stewart's children, so it's inherently a friendly book towards its subjects. It can't really conceal Fonda's monstrous behavior with his second's wife suicide, or how both men treated some women pretty coldly in their bachelor days. And there's a reference to a homophobic slur that Fonda reportedly uttered towards Charles Laughton and the "Well damn.." at the revelation that Jimmy Stewart might have been racist. It's a perfect duo to write about. Henry Fonda was extremely liberal. Jimmy Stewart was a die-hard Republican (though I wonder if he would still be one--since by old age he had mellowed out enough that he liked Bill Clinton, but was still startled/amused when he accidentally hung up on the president since that was a first for him). Henry was the intense loner with a string of failed marriages who longed for stage and chafed under Hollywood. Jimmy was the happy father and husband and a cheerful studio contract player who loved LB Mayer and defended the MGM system until the end. Jane Fonda went to Vietnam, and so did Jimmy Stewart's stepson that he raised, who died there (and thought it touching that Stewart, even though a big supporter of Vietnam War, would never let anyone say a bad word about his goddaughter in his presence). They were members of a touring company--one that included fresh faced Josh Logan and Margaret Sullavan--and quickly became roommates as struggling actors in NYC, and mutually became obsessed in building a giant model aircraft. Their move to Hollywood (Fonda beat Stewart there by a few months) was almost entirely preoccupied with getting the giant balsa wood model there safely. The plan to move the plane was Stewart's stress for the transcontinental move--Fonda made his way west, with a baby kitten in his pocket, that he fed with a moistened napkin. Yes, many of the moments of their friendship/lives are as cute as some of their famous cinematic scenes. Part of the reason they became friends seems like mutual interest in things like planes and giant kites and same sense of humor. Thought it also interesting that when Orson Welles moved to Hollywood, he at first thought it might be one of those "roommate" situations like Cary Grant and Randolph Scott, until he met both of them, and realized it was platonic. Since they did live together for it seems most of their single life--even when Stewart came back from WWII, he moved into Jane & Peter's playhouse in the backyard (which in Fonda fashion was swarming with cats--his flock reaching a record high of 37 at one point). The two men's WW2 service takes up the middle of the book, for good reason--since they both enlisted (Stewart before Pearl Harbor even--something LB Mayer wasn't happy about and Fonda insisted on going even though as family man and past the mandatory age could have easily gotten out like Wayne and others). Both saw war--Fonda in the Pacific in the Navy, diving into downed kamikaze planes to retrieve intelligence; Stewart as a real life flying Steve Trevor, flying 19 missions as lead bomber, rising to the rank of brigadier general by the end of his career, the highest of any actor. Stewart refused to talk about his time in the airforce and refused to make WW2 films after the war. But their war time trauma was another thing that bound the two men together, since the trademark of their friendship was they could pick their friendship no matter the absences. So it's a good, pretty sweet, comprehensive book on Stewart & Fonda, packed full of personal trivia. Stewart only eating white colored food (buttered sole and vichyssoise for dinner every night, washed down with glass of milk, followed by vanilla ice cream) as his disgusting diet. The adorable love affair between Stewart and his horse Pie (which is the horse featured in all his movies--the horse lived for 30 years and Stewart made sure it was buried with a headstone) and how Fonda painted a photorealistic painting of Pie to give to Stewart when the horse was in ill-health. How both men hated hunting and were not heavy drinkers (which explains now that I think about it, how rarely you hear of Fonda or Stewart in the carousing circles of like Gable or Flynn or Bogart). These were the guys painting model sets or doing needlepoint and embroidering furniture or getting into beekeeping or jazz. It's not a perfect book. As like everyone (and reams of telegrams, letters, and diary entries) make clear, it was never entirely a duo, but a fucked up love triangle with Margaret Sullavan. It might have been a better book if it was more apparent in this and included Margaret more entirely within--especially since Brooke Hayward also cooperated with this book. There are parts that are either padded slightly or typical conceit (I don't know why authors feel the need to include multiple paragraphs about how much a can of soup was going for in the circular that day or how much a super-deluxe 5000 phonograph player was on sale for). I just assume they spent a lot of time in the stacks, getting mesmerized by microfilm and get really into the advertisements and feel the need to work it into the book. I get the allure personally, but kind of hate it in all the same. So...this would have been stronger if all those times were cut out, and like a chapter or two just on Margaret Sullavan was inserted in, rather than her flitting in and out of each man's life to bedevil them (and I raised an eyebrow here and there on some of the wording in the book). Fans of Henry Fonda and Jimmy Stewart will want to read this biography, written by the author that recently wrote a biography of John Wayne. I was invited to read and review by Net Galley and Simon and Schuster, and so I read it free in exchange for this honest review. It’s for sale now. The book is well crafted, and multiple aspects contribute to its success. The first is the unglamorous but essential research. Eyman used extensive interviews with both actors’ families as well as directors and o Fans of Henry Fonda and Jimmy Stewart will want to read this biography, written by the author that recently wrote a biography of John Wayne. I was invited to read and review by Net Galley and Simon and Schuster, and so I read it free in exchange for this honest review. It’s for sale now. The book is well crafted, and multiple aspects contribute to its success. The first is the unglamorous but essential research. Eyman used extensive interviews with both actors’ families as well as directors and other actors that had worked with them. The second is the thoughtful analysis. Eyman’s insights are intelligent and fairly measured, never becoming prurient, gossipy, or mawkish. The third is his friendly, congenial narrative, peppered with telling anecdotes that keep the pages turning. It’s well organized and doesn’t rely on photographs to tell the story. These actors belonged to my parents’ generation, and so for a long time I was not much interested in them. More recently, though, I’ve found it’s interesting to see their craft, their lives, and their work as creatures of the time in which their careers blossomed, and as part of American entertainment history. The truth is that I never cared much for Henry Fonda. The only one of his movies I saw in the theater was On Golden Pond, and the harsh way he spoke to his daughter on the screen—who was also his daughter in real life, Jane—was so brutal that I never wanted to see anything more that he’d done, apart from the occasional old movie I ran across on television. Learning later that he was more or less the same father to her in real life didn’t help much. Eyman is unsparing as he describes this aspect of the Fonda family, but he also points to the mellower man he became later in life, and to the tremendous loyalty he showed his friends, Stewart foremost among them. I was more interested in Jimmy Stewart, who left a more timeless body of work. Harvey is a film I loved enough to search out and watch in turn with each of my children. Of course, at Christmas time I am inclined to pull out It’s a Wonderful Life, although none of my kids would watch it with me more than once. There was such heart in his roles. Because I like Stewart’s work, I had already read one biography fairly recently. Robert Matzen’s Mission: Jimmy Stewart and the Fight for Europe dealt well with his war years as well as the early years of his life, and so I didn’t enjoy the first half of Eyman’s book—which covered the same ground again—as I did the second half, which I found both comforting in places as well as mesmerizing. The second part also has more quotes by his children, who weren’t around for much of the stars’ earlier lives. And I came away with renewed respect for Jane Fonda, who had a harder road than I had previously understood. Now I have half a dozen movie titles I want to watch, or watch again; that’s a sure sign of a strong biography. And it makes me think warmly of my own longstanding friends, some of whom I’ve known and loved almost as long as the 50 years that Hank and Jim were friends. Intriguing stuff, once it gets going. Henry Fonda and James Stewart, two actors I admire greatly, in some of my all-time favourite Hollywood films. I never knew their relationship off the screen, and I was keen to learn about their lives, their craft, their friendship. Told from both their perspectives, we learn about each in turn - how they grew up and into the acting 'scene', how they met, the initial struggles breaking into films, and then the successes they both achieved, their family lives, their war-time experiences, their later lives and ageing. Many of their friends and colleagues, I had never heard of, and many of their films I have not seen, I wanted more detail on my favourites of course, but it really was fascinating learning of their different approaches to a role, how each achieved success in a different way and their oh-so-different personalities and beliefs. My eyes widened in a few places with some 'revelations' that the author brings up. I wasn't very interested in their World War Two lives, but their later status as revered actors and descriptions of their acting world did hold my attention. The look at two old men still friends and still able to communicate friendship with few words, but more vegetable products - it was quite tender and moving. Definitely one for lovers of the silver screen, I've since put two of Fonda's films on my 'to watch' list. The writing is fairly standard for a biography, it entertains (some naughty words here and there, with the intention of amusing the reader - it did), it informs, the pace is a little slow at times (the war years for me), but fills out the detail you're after. A very full portrait indeed, and one not afraid to show their darker side, their flaws. An honest portrait of two film icons. First of all, I very seldom read nonfiction so I probably rated this lower than someone who loves to read nonfiction. This book was mentioned on TCM - I think the host mentioned it when he did an intro to Rope (an amazingly directed movie with incredible acting by Stewart, but a less than stellar plot) and I was interested to pick it up. I think I knew going in that Hank and Jimmy were friends but I was interested to learn more about it. They were true friends in every sense of the word. Friends First of all, I very seldom read nonfiction so I probably rated this lower than someone who loves to read nonfiction. They were true friends in every sense of the word. Friends that could just pick up right where they left off after not seeing each other for months. I also liked that they enjoyed practical jokes. The book didn’t go much into the huge fight they had over politics that almost cost them their friendship, and I would have liked to learn more about that. If anyone knows classic films at all, then these two actors' names will be right up there with John Wayne, Humphrey Bogart, Spencer Tracy and Cary Grant. While their films, for the most part, of all these actors were very different, their onscreen presence was palpable. There was no mistaking that you were in the presence of a great actor when you sat down to watch. I have always known that Fonda and Stewart were best friends - anyone who claims to be a classic film buff would know this. And, I m If anyone knows classic films at all, then these two actors' names will be right up there with John Wayne, Humphrey Bogart, Spencer Tracy and Cary Grant. While their films, for the most part, of all these actors were very different, their onscreen presence was palpable. There was no mistaking that you were in the presence of a great actor when you sat down to watch. I have always known that Fonda and Stewart were best friends - anyone who claims to be a classic film buff would know this. And, I must say, I knew quite a bit about their professional lives, and their personal, as far as marriages. I also knew that they both served in World War II, Fonda in the Navy and Stewart in the Army Air Corps. However, Mr. Eyman has gone far deeper into their pasts. He begins right where they do - from birth; and tells us of their very different upbringing in life. He goes on from there to their early life on the stage, and their eventual move to Hollywood. But their lives take very different turns. Hank was married five times - he was wound too tightly most times to make a marriage stick; his emotions stayed beneath the surface and were rarely exposed; Jimmy was married once, when he was 41 - Gloria was the love of his life and the marriage was a happy one. Their careers took different turns, also: Hank preferred stage to screen; Jimmy stayed in Hollywood and made many memorable films (and a few he probably wished he hadn't). But the films Hank made were, for the most part, memorable also, and I am sure everyone has that particular film of both of them that stays with you and you will watch over and over. I love Hank's films The Mad Miss Manton, Mister Roberts, and The Rounders (not a spectacular film, but very funny). For Jimmy's films, I love The Shop Around the Corner, Rear Window, and The Rare Breed. It is obvious that Mr. Eyman has done extensive research on his subjects. The book is neither cloying nor filled with Hollywood gossip; it gives us an honest and well-written biography about two remarkable men, the like of which will never be seen again. While I've read other biographies of Fonda and Stewart, I believe that Mr. Eyman's is the best by far. While I am sure there are those who like only one or the other, I consider myself a true classic fan, and while I may not like an actor personally, I can watch their body of work and appreciate it for what it is. While this book points out that Hank wasn't the best father in the world, he also changed as he got older, and his loyalty to his friends was always unwavering. Perhaps because they never expected anything from him, knowing he didn't offer up as much of himself. Jimmy, on the other hand, seems more open and giving to both family and friends. They were there for each other through triumphs and tragedies; through good times and bad; and never allowed their personal politics or personal demons stand in the way of their enduring friendship. One can only hope for a friendship in their life as strong as the one between these two. I am grateful for this book, for giving us the insight into two remarkable men who became extraordinary actors and had an exceptional friendship. Highly recommended. A very enjoyable read---I love to read books about artists, geniuses, legends---and these two guys were all of those. The acting profession fascinates me. What I got most out of the book was the way these 2 guys aged---Henry Fonda was looking for ore acting work while dying of cancer. Jimmy spent the last 3 years of his life depressed that all of his friends (and wife) died. I'd rather go down kicking and fighting like Henry. To Jimmy, I would say get some young friends and develop those relationshi A very enjoyable read---I love to read books about artists, geniuses, legends---and these two guys were all of those. Renowned film historian Scott Eyman explores the lifelong friendship between two Hollywood legends: Henry Fonda and James Stewart. I have mixed feelings about this one. The subject matter is fascinating but the book kind of fell flat to me. Well-researched, well-organized and the transitions were smooth. Something was lacking though. An amiable amble through the lives and friendship of Henry Fonda and Jimmy Stewart, with brief informative asides about the economic boom of the 1920's, the Depression, World War II and the evolution of the Hollywood business model as seen through their experiences. Fonda's inability to process his own feelings except on stage and screen and the effect the loss of Stewart's stepson in Vietnam has on him achieve real poignance. Good, but I would really like a comprehensive biography on both men. Because Eyman had to split between the two, everything kind of felt glossed over. When I saw this book was coming out, I put it on my to-read list because I like both of these actors and did not know they were such close friends. I have enjoyed Eyman's other biographies, so I was excited to read this for my summer #classicfilmreading. I thought it was a fun look at both men: how they got into acting, their friendships, their WWII service, their marriages and children, how they dealt with aging in their profession, and the end of their lives. I thought this book was well-resea When I saw this book was coming out, I put it on my to-read list because I like both of these actors and did not know they were such close friends. I have enjoyed Eyman's other biographies, so I was excited to read this for my summer #classicfilmreading. I thought it was a fun look at both men: how they got into acting, their friendships, their WWII service, their marriages and children, how they dealt with aging in their profession, and the end of their lives. I thought this book was well-researched and well-written. The author interviewed friends and family of both men (and even gives acknowledgment to Robert Osborne at the end, so that made me smile). I found the WWII section to be a little drawn out, and I did lose interest for awhile here. I think this is because Stewart didn't speak much (if at all) about his war time experience, so there was extensive description of Stewart's job and responsibilities which didn't seem like the personal experience of him that I was looking for. The section on Fonda's service didn't seem as drawn out to me, but there was more personal anecdotes here. Henry Fonda and James Stewart were two of the biggest stars in Hollywood for forty years. They became friends and then roommates as stage actors in New York, and when they began making films in Hollywood, they roomed together again. I am going to start off by thanking Netgalley, Simon & Shuster and the author for allowing me to review this book because I LOVED IT. I am a serious fan of both James Stewart and Henry Fonda - "It's a Wonderful Life" and "Mr. Roberts" are two of my all-time favourite films. The fact that they were such good friends often made me scratch my head but this book explains why opposites attract. Their hijinks in the early days in New York made me laugh out loud at time. I have always heard that Fonda and his daughter Jane had a horrible relationship (Jane found him very repressed and was baffled at all his marriages -(not that she did much better in the marriage game either in the end...) so I hoped to learn more about that but the subject was never broached. I loved reading about Jimmy's love of family and his marriage to his one true love, Gloria. Scott Eyman has written some of the best Hollywood/film/entertainment books out there and this does not disappoint. He is thorough, entertaining and insightful from page one to the end and his writing style is very easy to enjoy. If you are a fan of this genre, you will not be disappointed --- if you are NOT a fan, this book may turn you into one.! A terrific book. Insightful in both its looks at these complex men and its look at acting as an art form. Recommended. Henry Fonda and Jimmy Stewart are two of my all-time favorite actors. 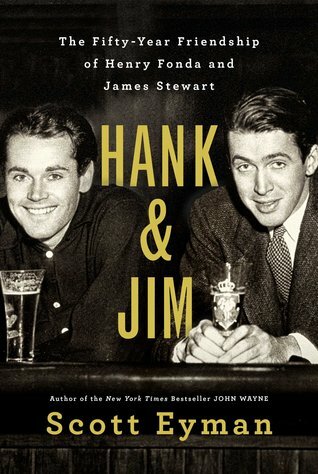 So HANK AND JIM: The Fifty-Year Friendship of Henry Fonda and James Stewart, by Scott Eyman? What a great holiday present for movie fans. Eyman, who specializes in biographies on some of Hollywood’s greatest figures --- John Ford, Cecil B. DeMille and John Wayne, to name just a few --- does a sweet job in portraying how these two icons came to their profession, contrary to the desires of their fathers (who eventually came aroun Henry Fonda and Jimmy Stewart are two of my all-time favorite actors. 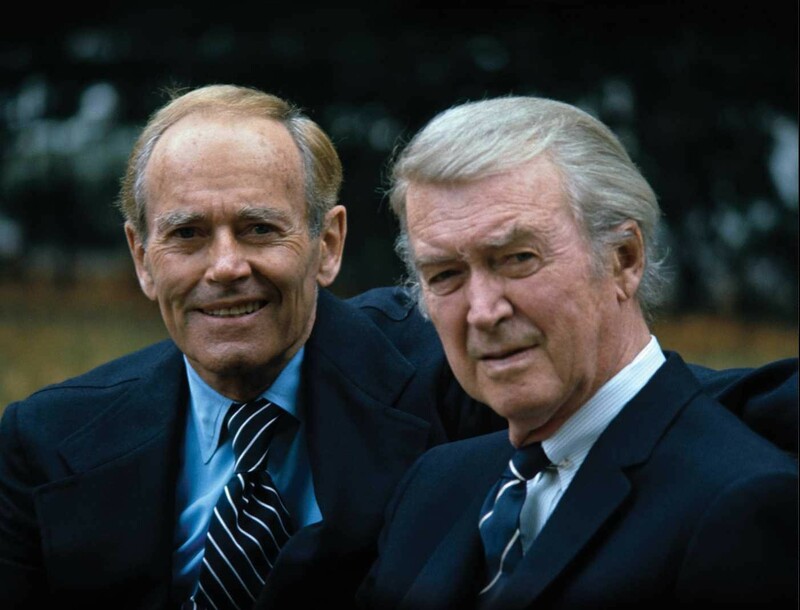 So HANK AND JIM: The Fifty-Year Friendship of Henry Fonda and James Stewart, by Scott Eyman? What a great holiday present for movie fans. Eyman, who specializes in biographies on some of Hollywood’s greatest figures --- John Ford, Cecil B. DeMille and John Wayne, to name just a few --- does a sweet job in portraying how these two icons came to their profession, contrary to the desires of their fathers (who eventually came around). In the movies, one might describe the circumstances of Fonda’s and Stewart’s as “meeting cute.” They were introduced as twenty-somethings following a performance by the former. They were taken with each other, and their similarities formed the basis of that half-century relationship. What makes this relatively unusual were their differences. Fonda was married several times, while Stewart was a one-woman husband. Fonda’s relationship with his children was strained, while Stewart doted on his, twins by his wife Gloria’s previous spouse and their own twin sons. Then there’s the politics: Stewart was a staunch Republican, while Fonda was a liberal Democrat. As good friends often do, they agreed to disagree about that and never spoke about this aspect of their lives. Both actors enjoyed great success before and after World War II. Much has been written about Stewart’s service as a bomber pilot, but there’s been comparatively little when it comes to Fonda’s stint in the Navy. Like his friend, though, Fonda was a decorated serviceman who took his work seriously, not wanting special treatment or duty because of his celebrity status. Their war experiences impacted their work upon returning to civilian life. As Eyman writes, “Like millions of other returning veterans of the war, Stewart remembered he was emotionally exhausted and professionally unsure.” He no longer wanted to do lighthearted fare as he did in such films as Born to Dance, The Ice Follies of 1939 and It’s a Wonderful World (as opposed to It’s a Wonderful Life, one of his signature films), and his later work included darker themes in Vertigo, The Man Who Knew Too Much and Winchester '73, where he displayed various neuroses more in line with someone who had seen the horrors of war. Fonda, too, wanted to do more “serious” work. He complained about the film version of Mister Roberts --- one of his most famous roles and one that he played in the theater (another difference between the two pals) --- as being too funny. While many film buffs enjoy their favorite performers, they rarely look beyond what they see on the screen. They don’t understand --- either by choice or by simple ignorance --- that they are people with anxieties, worrying about how they will be perceived in a given role and what the future holds, especially as they grow older and parts they had played in the past are no longer age-appropriate (Stewart portrayed Charles Lindbergh in The Spirit of St. Louis, even though he was some 20 years older than Lucky Lindy when he made his historic non-stop flight over the Atlantic). Eyman also does an excellent job in offering the friction between Stewart and Fonda with writers and directors over various artistic differences. There’s relatively little gossip in HANK AND JIM, which may delight or disappoint, depending on the reader. While they may have gone through long periods where they didn’t have contact with each other, there’s was a friendship in which words weren’t necessary. They could sit together for hours at a time with barely a word exchanged. The end for both men was, of necessity, sad as illness sapped them of their loved ones and their own lives; Gloria Stewart predeceased her husband by several years, leaving him depressed and rudderless. But that’s part of the story. Not every ending is a happy one. In Hollywood, where marriages last for days and weeks, a fifty year friendship is something remarkable. 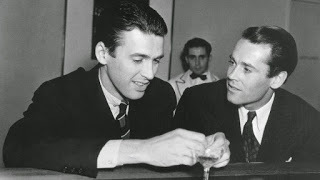 So the remarkable relationship between Jimmy Stewart and Henry Fonda is a affirmation of loyalty, friendship, and sometimes ignoring big differences to stay in each others lives. the two laconic men--tall, quiet, the very portrait of American values -- met as young collegiate in a college theatre group that hatched some of the icons of show business including Joshua Logan and Leland Heyward. Th In Hollywood, where marriages last for days and weeks, a fifty year friendship is something remarkable. So the remarkable relationship between Jimmy Stewart and Henry Fonda is a affirmation of loyalty, friendship, and sometimes ignoring big differences to stay in each others lives. the two laconic men--tall, quiet, the very portrait of American values -- met as young collegiate in a college theatre group that hatched some of the icons of show business including Joshua Logan and Leland Heyward. The post-college group was the very definition of a network. There was another link and that was actress Margaret Sullivan. The elfin, quicksilver Maggie or Peggy (to Fonda) was the object of several of the men's affection and Fonda's second wife but lifelong love. Sullivan who, at the very least, was bi-polar went on to costar in several of Stewart's movies and the chemistry between the two was palpable. However, it was Fonda who she loved deeply and lost painfully. For the two men, and many others of their generation, of the Greatest Generation, World War II was the centerpiece of their lives. Stewart, a trained pilot, rose to the level of Colonel in the Air Force (then the Army Air Corps) in the European theatre. Fonda road ships around the South Pacific, an experience he would later use in his performance as" Mr. Roberts". Although the experience was seminal for both men and merits discussion, the part of the book devoted to their service goes on too long and will require a push to get through it. In the post-war years, the two men found that the war had changed them immeasurably and they could no longer play lighthearted roles (although that was more a problem for Mr. Stewart than for Mr Fonda). After the war, both persisted as established stars but floundered in their choice of roles and how they acted on screen. Stewart was still the American everyman (Tom Hanks seems to be his natural heir). However, Fonda -- quiet, intense, and emotionally shut off -- created a different on-screen character, one that carried into his private life resulting in five marriages (a constant embarrassment to him) and a damaged relationship with both of his children, Jane and Peter. Jane's involvement in the anti-war movement of the sixties, was a constant source of conflict between father and daughter even though Fonda, himself, was a diehard liberal. Stewart, on the other hand, had an incredibly stable and long lived marriage, and a lifelong commitment to Conservativism. When his stepson was killed in Vietnam, it shook him deeply, casting a pall over the rest of his life. There seems to have been a lot of cooperation from Hollywood figures and film historian, Robert Osborne, to make this book authoritative and complete. The overlong chapters of the war years do, at least, reveal a great deal about the formative experiences of these star's lives. At times, it seems like the author is trying to hard and some of his writing becomes awkward and pretentious because of that fact. Nevertheless, for those who remember the power of the studio system and the long period when actors were big, as Norma Desmond, opined. "They took the idols and smashed them, the Fairbankses, the Gilberts, the Valentinos! And who've we got now? Some nobodies!" Add to that list the Fondas and the Stewarts, great actors who spent their later years struggling to find roles big enough to encompass their greatness. This is a "must read" for movie fans, both Boomers who still have a memory of these two legendary actors in their later years, and younger fans who may need to learn what made actors really great. Henry Fonda and James Stewart were two of the biggest stars in Hollywood for forty years. They became friends and then roommates as stage actors in New York, and when they began making films in Hollywood, they roomed together again. Between them they made such memorable fil New York Times bestselling author Scott Eyman tells the story of the remarkable friendship of two Hollywood legends who, though different in many ways, maintained a close friendship that endured all of life’s twists and turns. For Hank and Jim, biographer and film historian Scott Eyman spoke with Fonda’s widow and children as well as three of Stewart’s children, plus actors and directors who had worked with the men—in addition to doing extensive archival research to get the full details of their time together. This is not another Hollywood story, but a fascinating portrait of an extraordinary friendship that lasted through war, marriages, children, careers, and everything else. What a descriptive and all encompassing novel of these two fine actors. I have loved both of these actors for years. I am not a big biography reader, but I was drawn to this because of Henry Fonda and Jimmy Stewart. The Author did a great job telling how these two grew-up, grew together and lasted as friends for so long. It really was interesting to get such an in depth look into their lives. I cannot imagine how much research and interviewing he had to do to come up with all these private details of both of their lives. Excellently well done! As a lover of old Hollywood, movies and these two fine actors it was wonderful to read this book. I would highly recommend it. I’d always heard about Henry Fonda’s poor relationship with his daughter, Jane, but didn’t understand why it was so. I still don’t. Jane describes him as a pent-up guy, but his friendship with Jimmy Stewart was as intimate as he ever got with anyone. Together, they relaxed and had fun, which they couldn’t do separately. They were both tall and skinny, laconic and shy, loners, with the same sense of humor―wry and goofy. They shared an apartment in New York in the 30s with Myron McCormick and Josh Logan, subsisting on rice. They attended art openings and gorged on hors d’oeuvres. Together, they built model airplanes. Much has been written about Stewart’s war years as a B-24 pilot. Fonda served as an naval intelligence officer aboard the USS Curtiss in the Pacific. When a kamikaze was shot down and crashed twenty-five yards from the Curtiss, Fonda and two sailors dived on the plane and recovered maps and flight plans. Fonda determined the kamikazes launched from Pagan Island in the Marianas. An air strike stopped them. Fonda had been aloof before the war; afterwards, he was remote. The silence during car rides or at the dinner table unnerved his children. He rediscovered his dad’s hobby of kites in the Navy, and began flying them, as large as possible, after the war. He’d be quiet and stressed until the kite was airborne, then become exuberant as a kid. Both actors took a while to re-establish their acting careers. Fonda preferred the stage in New York and could go for years without making a movie. Stewart preferred making movies in California. Years could pass without them seeing each other. In his later years, Fonda stitched complicated needlepoint patterns he designed himself. Most needlework on chairs and pillows in his home were his work. He also made macramé baskets. Like Stewart, he was an avid gardener and also kept bees. Little is said about Fonda’s relationship with his parents, who both died in the 1930s. Stewart’s father never lightened up with his son, even when Jim was in his 50s. Many people remembered Fonda as cold. Stewart was easy-going, but no one really got to know him. Only when they acted did they show emotion. A fascinating look at two long-gone screen icons. Henry Fonda and Jimmy Stewart are the stars of two of my favorite movies: It’s A wonderful Life and 12 Angry Men. I never knew they were such good friends and was pleasantly surprised by the way the author depicted their lives in Hank & Jim. These men might be idolized as Hollywood heavy weights who stole every scene they were in, but off screen they were humble, honorable, and loyal men who were great friends with each other. This had lots of aspects. First of all, it was a condensed biograp Henry Fonda and Jimmy Stewart are the stars of two of my favorite movies: It’s A wonderful Life and 12 Angry Men. I never knew they were such good friends and was pleasantly surprised by the way the author depicted their lives in Hank & Jim. These men might be idolized as Hollywood heavy weights who stole every scene they were in, but off screen they were humble, honorable, and loyal men who were great friends with each other. This had lots of aspects. First of all, it was a condensed biography of two men in a relatively short book, and that alone was a feat. I was impressed that the author managed to pack so much in the book. He included funny stories, that for me weren’t all that funny, but did show each man as a prankster and illuminated their sense of humor. There were details for each project the men worked on that helped a movie buff like me really get to know how each of them worked as an actor and how they came to be in each project they took. Several times the author devoted snippets to other people and their personal lives which I did not find to be relevant to the overall biography. I hate that! Also, the author managed to reveal details about each man's private family life so succinctly that I felt that I completely understood the whole of these men lives. I liked learning about their participation in World War II, and how seriously they took their duty to their country even though it interrupted their blooming careers. Their ability to tinker with model airplanes with minimal conversation to each other shows how comfortable they were together as friends. The inclusion of quotes from their friends and family also personalized the biography and showed the impact that each man had on the other's family as well. I truly appreciated learning so much about Henry Fonda and Jimmy Stewart through the story of their friendship and would recommend this biography to movie fans like me. Scott Eyman's engrossing, comprehensive and nuanced dual biography of Henry Fonda (1905-1982) and James Stewart (1908-1997) chronicles the Oscar-winning actors' private lives, careers and 50-year friendship. The two were a study of contrasts: Fonda was a fierce liberal, agnostic and workaholic who wed five times; Stewart was a Republican, church-going family man who was happily married for 45 years. Both were loners who found the right profession. "Acting allowed them to express emotions neither Scott Eyman's engrossing, comprehensive and nuanced dual biography of Henry Fonda (1905-1982) and James Stewart (1908-1997) chronicles the Oscar-winning actors' private lives, careers and 50-year friendship. The two were a study of contrasts: Fonda was a fierce liberal, agnostic and workaholic who wed five times; Stewart was a Republican, church-going family man who was happily married for 45 years. Both were loners who found the right profession. "Acting allowed them to express emotions neither of them could have otherwise expressed, use experiences that they would have blocked," writes Eyman. The friendship began in 1932, when the two struggling actors became roommates (with actor Myron McCormick and director Josh Logan). Both entered motion pictures in 1935, and within five years had become leading men competing for the same Best Actor Oscar in 1940 (Stewart won for The Philadelphia Story, but he voted for Fonda in The Grapes of Wrath). The two lived on opposite coasts in the 1950s, when Stewart's film career soared (Rear Window, Vertigo) and Fonda abandoned his film career for seven years to return to Broadway in Mister Roberts. In the 1960s and '70s, the duo co-starred in three films. Thanks to fresh interviews with Jane and Peter Fonda and Fonda's widow, Shirlee, Eyman (Empire of Dreams: The Epic Life of Cecil B. DeMille) creates a particularly satisfying portrait of the conflicted and remote Fonda. Fans of both actors will enjoy Hank & Jim, a well-researched and absorbing biography that celebrates and humanizes two complex men and their enduring friendship. Scott Eyman has authored 11 books, including, with Robert Wagner, the New York Times bestseller Pieces of My Heart. Among his other books are "Lion of Hollywood: The Life and Legend of Louis B. Mayer," "Print the Legend: The Life and Times of John Ford," "Ernst Lubitsch: Laughter in Paradise," and "The Speed of Sound" (all Simon & Schuster) and "John Ford: The Searcher" for Taschen. He has l Scott Eyman has authored 11 books, including, with Robert Wagner, the New York Times bestseller Pieces of My Heart. He has lectured extensively around the world, most frequently at the National Film Theater in London, the National Gallery of Art in Washington, D.C., the Los Angeles County Museum of Art, and the Moscow Film Theater. He's done the commentary tracks for many DVD's, including "Trouble in Paradise," "My Darling Clementine," and Stagecoach. Eyman has written for the New York Times, the Washington Post, and the Chicago Tribune, as well as practically every film magazine extinct or still extant.